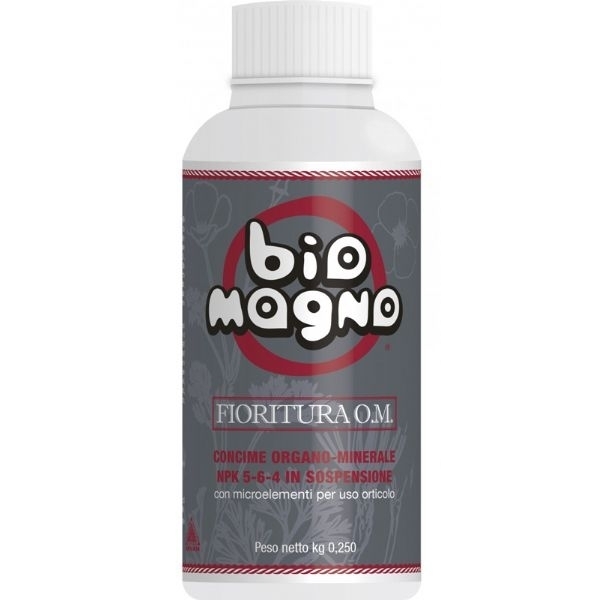 Biomagno Bloom O.M. is an Organo-mineral fertilizer in a fluid state designed to stimulate the processes of flowering and fruiting of plants by providing all the necessary elements for a blooming production. It Contains: nitrogen, N (5%) - phosphorus, P (6%) - potassium, K (4%) - carbon, C (3%) - sulfur, S (0.6%) - magnesium, Mg (0, 3%) - iron, Fe (0.4%) - trace elements (Ca, Cu, Zn, B, Mn, Mo) - enzymes - bacteria - proteins - carbohydrates - peptides - amino acids - humic - fulvic acids - crenic acids - vitamins. It increases the concentration of sugars.